Limnos (Λήμνος) is a low lying island of 477 km2 with 16,000 inhabitants. The tallest peak of Skopia is only 430 m above sea level. It is an island not visited by many tourists and very beautiful. Being strategically located at the entrance of the Dardanelles, Limnos has had a long history. 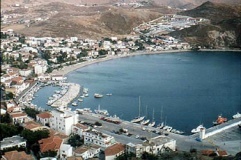 Limnos has many bays, the largest of which is the Bay of Moudros (Κόλπος Μούδρος) is one of the largest natural harbors in the Mediterranean. During the Gallipoli campaign of World War I it was the anchorage of the Allied Fleet. Today, there is a large military presence mostly based at the large airfield adjacent to the bay. 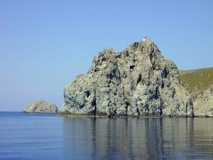 Most approaches to Limnos are without dangers and straightforward. The exception is Moudros Bay where there are a number of reefs. If you are either entering or exiting Greece you must go to the Limenarchio (Coast Guard), right across the road from the yacht quay in the harbour of Myrina. If entering Greece, they may call Customs and after checking your papers direct you to wait for the customs official in your boat. They may instead direct you to Customs officials in the adjacent office of the same building where you can complete all paperwork (including purchase of a Transit Log). For non-EU residents the Coast Guard may arrange for your passports to be stamped by the police, in which case you will pick them up and complete the paperwork later. 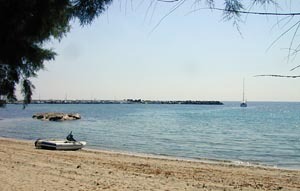 There is only one harbor, Myrina, but there are several attractive anchorages on the island. 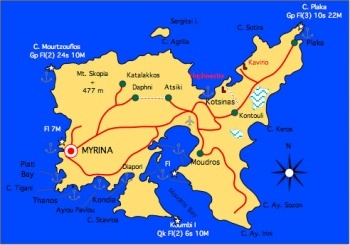 Myrina (Μύρινα) or Mirina provides very good shelter. You can either moor stern-to on the N quay or anchor off-shore. The inner harbor is too shallow and it is crowded with fishing boats. The mooring places at the N quay are not many and it best to arrive early. The harbor water is dirty. Caution: Avoid the spot where the ferryboat from Ayios Efstratios moors. If you tie there, the Limenarchio (coast guard) will be asking you to move at a very early morning hour. The town of Myrina is very attractive with many reminders of its Ottoman past. 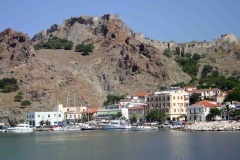 It is dominated by the Byzantine castle, built by the emperor Andronikos. There are many stores and little streets, yet it is not crowded and there is an over all laid back atmosphere. There are water and electricity outlets by the quay and a mini-tank delivering Diesel fuel comes by in the afternoons (tel. +30 2540 26 077). Good shopping and restaurants. 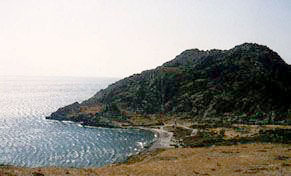 The Bay of Moudros (Κόλπος Μούδρος) is one of the largest natural harbors of the Mediterranean. 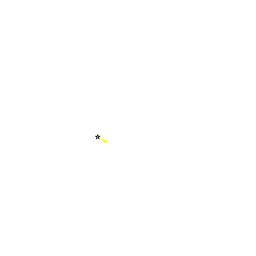 While in general safe, it is large enough to develop an uncomfortable swell during strong winds. This fact, coupled with murky water, makes it not very attractive for yachts. 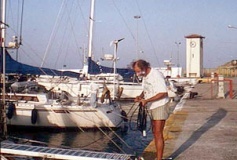 A quay has been constructed at Moudros itself, which offers alongside mooring for 6-8 yachts and (on the south side) reasonable shelter from the meltemi. Water and electricity is available on the quay. Good tavernas ashore. If you wish to anchor, there are many coves in the bay, but during the meltemi, which blows here in violent gusts from the NE, it is best to anchor just to the S of the town, located on the E side of the bay, if no space is available on the quay. With southern winds, Vourlidia bay/wiki/Limnos#Vourlidia_bayanchorage Vourlidia bay [[Limnos#Vourlidia bay|Vourlidia bay]] 39°51.2′N, 25°11.6′EVourlidia bay39.853333333333;25.193333333333 to the SW offers excellent protection despite the violent gusts. Care must be taken to avoid the reef in the middle of the bay and the shallows. Anchor in 3-4 m excellent holding. Danger: There numerous reefs blocking the entrance of the inner bay. Do not enter during the night. 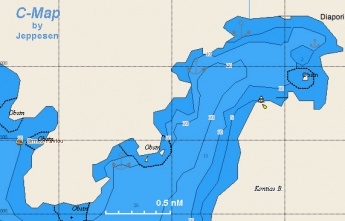 Ormos Kavos/wiki/Limnos#Ormos_Kavosanchorage Ormos Kavos [[Limnos#Ormos Kavos|Ormos Kavos]] 39°51.1′N, 25°14.6′EOrmos Kavos39.851666666667;25.243333333333 on the east side and immediately south of the inner bay provides good shelter from north-west through east winds. It is a very attractive anchorage with clear water, small caves that can be dinghied up to and low cliffs. The beach regularly has a few people on it. Anchor in 2.5 to 5m on sand - very good holding. 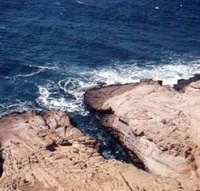 Kondias Bay (Κόλπος Κοντιά) is W of Moudros and N of Cape Stavros. It provides good shelter from the meltemi but it is open to the S. At the NE of the bay, Diapori (Διαπόρι) provides almost all-round shelter. 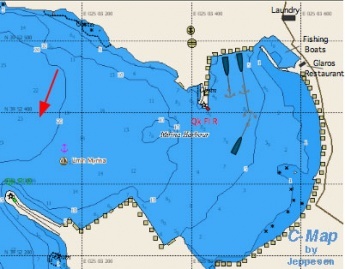 Also, especially with SE winds the two coves NW/wiki/Limnos#two_coves_NWanchorage two coves NW [[Limnos#two coves NW|two coves NW]] 39°50.97′N, 25°09.1′Etwo coves NW39.8495;25.151666666667 are very attractive. Anchor in 4-5 m, good holding. There is a taverna at Diapori which opens only during the day in the summer but the village of Kondias is only about 40 minutes on foot from the NW coves and some provisions can be obtained. It provides some shelter from the meltemi but not as good as either Kondias Bay or Ormos Thanos. Ormos Thanos (Όρμος Θάνος) is a very attractive anchorage and well protected from the meltemi. 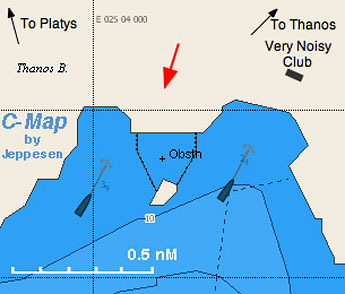 It is open to S. Anchor E of the little island at about 5 m depth. We have comfortably weathered a force 8 gale here. The sand beach is very clean. Unfortunately in the last few years the deserted sandy beach has been invaded with day restaurants with umbrellas and reclining chairs and worst of all loudspeakers blasting techno "music." The cacophony during the day is overwhelming. In the evening things are quiet. The town of Thanos is about a 45 minute walk and has an excellent restaurant offering grilled meats. Good spear fishing around the little island. 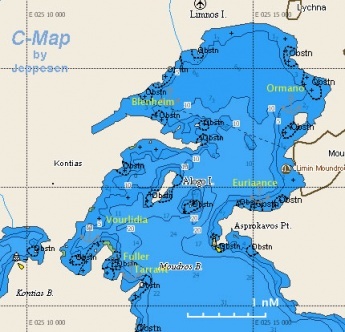 A more quiet option is to go to west of the Thanos/wiki/Limnos#west_of_the_Thanosanchorage west of the Thanos [[Limnos#west of the Thanos|west of the Thanos]] 39°50.4′N, 25°04.1′Ewest of the Thanos39.84;25.068333333333 . Here there no restaurants and umbrellas. The dirt road from here does not lead to the town of Thanos but to Platys. Just to the E of the Cape Tigani (frying pan) there is a tiny very attractive cove. It is suitable only when the weather is sheltered for a brief stop. There is excellent spear fishing around the little island S of the cape. It is N of Cape Tigani and provides good shelter from the northerly meltemi but it is exposed to the SW. Caution: There is a reef at the entrance to the cove. 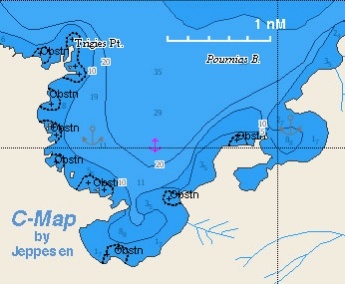 Just S. of Cape Mourtzouflos there is a very pleasant anchorage, sheltered from the meltemi. Anchor at 4-6 m on sand, good holding. 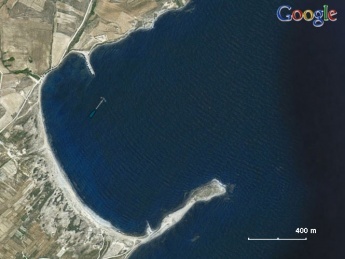 During Byzantine times Kotsinas (Κότσινας) was a harbor serving the capital of the island. 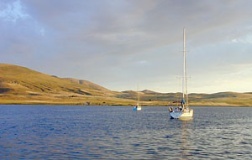 It is a safe anchorage but during a strong meltemi it develops an uncomfortable swell. One cannot get too close to the shore because it is shallow. 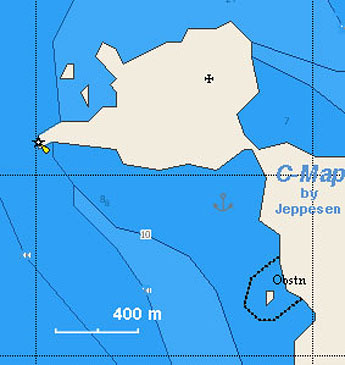 Anchor in the lee of the NW cape in 4-5 m. Good holding. The tiny fishing harbor of Kotsinas can be visited with the dinky. There 3 tavernas, but the Maroula, not on the waterfront, is considered the best. Right S of the NE tip of Limnos there is a nice cove that provides some shelter from the meltemi and good shelter from the southerlies. The best place is to anchor off in 3.5-4.5 m depth on a sand spot inside the water breaker of the small fishing harbor in the N side. With a strong meltemi some swell comes in but it is perfectly safe. 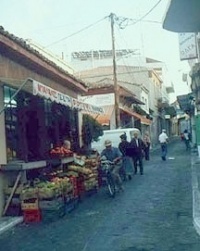 The small village of Plaka is a 45 min walk where only basic provisions can be found. Caution: To the E towards the beech it gets shallow very quickly. At the quay in Myrina. An attendant comes and will connect you for a minimal fee. Keys may be purchases anytime from Lemnos Hotel on the waterfront. At the Port Authority building. At the Port Authority building, you have to ask at the Port Auth. office to turn the heater on. Turn right (East) at the first intersection of the main road in Myrina, 3 Ag. Nikolau St. (+30 225 402 5484). They can wash and iron a load within a few hours. Alternatively: Vicky (tel. +30 693 681 5902) will collect laundry from the boat and deliver back. There are bins around the harbors and in several anchorages. Glaros/wiki/Limnos#.27.27Glaros.27.27eatingout Glaros [[Limnos#Glaros|Glaros]] to the S of the fishing inner harbor has excellent fish and shrimps. There are many other restaurants. Tasos/wiki/Limnos#.27.27Tasos.27.27eatingout Tasos [[Limnos#Tasos|Tasos]] In the town of Thanos (up the hill) the taverna has very good chicken grilled on the spit. There are daily flights to Athens. According to mythology, the metal smith god of fire, Hephaestos, had his workshop in Limnos. It was also here that he had his honeymoon when he wedded the beautiful goddess of love Aphrodite. Shortly after the wedding, she was unfaithful to him. Hephaestos accused her of her infidelity to Zeus and called as his witnesses the women of Limnos. The goddess, angered by this, had her revenge by making the Limnian women totally unattractive to their husbands. The women, in their turn, rebelled against the men and butchered them, all except Thoas who was saved by his daughter Hypsilpyle who became the queen of the island. When the Argonauts stopped in Limnos on their way to Colchis, they had affairs with the man-starved ladies and the island was re-populated. The first known inhabitants of Limnos were the Pelasgians (a Pelasgian inscription has been found from that era which has not been deciphered). Before the Persian Wars the Athenian Miltiades, the future victor of Marathon (490 BC), drove the local inhabitants off and re-populated the island with Athenians. The island changed hands many times and fell under the Macedonians and later under the Romans. It then became part of the Byzantine Empire until 1204 AD. After that time it alternated between the Genoese and the Venetians. The Ottomans took the island in 1478, it was re-occupied by the Venetians in 1656, and it fell back again to the Ottomans, who held it until 1920 when it became part of Greece with the town of Myrina as its capital. 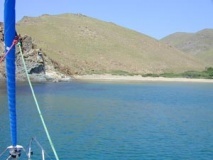 Limnos is a large island with many wonderful and secluded beaches and reddish brown landscapes. There are several points of interest. The town of Myrina is very attractive with strong reminders of its Ottoman past. 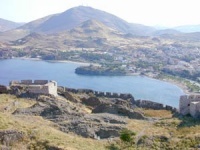 It is dominated by the Byzantine Castle. There are many stores and little streets, yet it is not crowded and there is an over all laid back atmosphere. The Castle, which is quite large in area, is Byzantine. It was built by the emperor Andronikos Komnenos in 1186 AD. Andronikos assumed the throne after murdering his young nephew and marrying his teenage wife. He was in his late fifties. He ruled with a heavy hand until he was deposed and mutilated by the angry mob. The Castle, now in ruins, is still imposing and affords a wonderful view. Roaming in the grounds of the castle is a large herd of roe-deer. They are really beautiful. I was told that they are native to Limnos and are now protected. The castle is open to visitors and it is an easy 10 minute walk from the harbor. On the N of the Castle, at the other end of the town facing, the W coast, there is an elegant esplanade. On the esplanade, there is the Archaeological Museum. While it is not a very large museum, it is a model of what a museum should be. It is housed in a restored neoclassical building and kept meticulously clean. The exhibits are attractively presented in modern, well lit, cases. Each exhibit is numbered and on the wall there are explanatory labels in 3 different languages corresponding to the exhibit numbers. The only disappointment is that a number of interesting objects had been removed to the National Museum in Athens and only their photographs are shown here. Hephaestia (Ηφαιστία) is the location of the classical city dedicated to Hephaestos. To the E of the site there is a very good harbor, used in the antiquity, but today its entrance is silted and the waters are brackish. The site has been excavated by the Italians and the Greeks, who have discovered a sanctuary believed to be of the Great Goddess, same as the one worshipped at Samothrace, a palace, and a small theater. The view from the hill toward the angry north sea is wonderful. The site is about an hour drive from Myrina. The road up to the village of Kontouli is paved but after Kontouli it is rough dirt. To the E of Hephaestia towards Plaka, the easternmost village of Limnos, the road branches to the N leading to the site of Kavirio. Just before reaching the site, there is a very elaborate hotel complex (now unused), said to have been one of the most luxurious in Greece. Kavirio (Καβείριο) is the site a Hellenistic temple dedicated to the Kaviroi or Cabiroi. Their origin is rather obscure, they could be associated with the Great Gods worshipped in Samothrace, or, according to a later source they are the offspring of Hephaestos. At any rate their site is very imposing, overlooking the angry sea. Next to the Kavirio site is the "cave of Philoctetes." Philoctetes was a member of the expedition to Troy. He was bitten by a snake in Tenedos and his wound festered. The rest of his mates, not being able to withstand the smell of the wound, abandoned him in Limnos where he lived in a cave and subsisted on game that he hunted with his bow which had belonged to Herakles (Hercules). 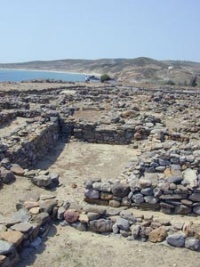 Poliochni is the major pre-historic site in Limnos. There are early Neolithic layers and more recent Bronze age layers dating from 2000 to 100 BC. The excavations are substantial and the site is stark but the sea is beautiful. The whole peninsula is a protected wild life habitat. It is wild place with breath taking cliffs and steep canyons. Well worth a visit. Mostly rough dirt roads. From the village of Kontouli instead of driving back to Myrina one can go to Atsikiand turn into a dirt road leading to Daphni and eventually to the picturesque village of Katalakkos (Κατάλακκος). From Katalakkos you can descend to the main road leading to Myrina. This was a very lovely ride. This page has been accessed 37,578 times.